In terms of be-bop there’s a lot of material out there, but in general nothing had been written about what I was wanting to know. So in the late ‘90s I began interviewing the drummers who had played on these records that had influenced us. The oldest guy I interviewed was Johnny Blowers who was 94 years old at the time. He had played with Louis Armstrong and Sidney Bechet and had learned press roll patters from Zutty Singleton, who we consider to be one of the first great New Orleans jazz drummers going back to the teens! Gene Krupa was really the guy who took the drummer from being the time keeper in the back of the band and brought him forward, so that he or she was as much a part of the band as anybody else. Why is New Orleans such a legendary music town? Here’s why …..
We always hear talk about New Orleans being such a great music town. Well, here’s a perfect example of WHY. Imagine living in a city where you can walk out your door every day and find this kind of a jam underway. And imagine if that jam was open to ANYONE who showed up with an instrument. Hosted by singer and trombonist supreme Glen David Andrews, this particular jam incorporates Mardi Gras Indian chants, brass band second line, drum set, and electric guitar. Like New Orleans itself, it represents how musical barriers are meaningless when people come together, find common musical ground and play WITH one another. It’s not pretty, it’s not slick, it’s not organized, but it s damn sure REAL. Jams like this have been going on in N’Awlins for literally two hundred years or more (going back to the slave “ring shouts” in Congo Square)! The young man in the foreground playing the marching snare can’t yet be ten years of age, but he is “in it” as deep as anyone esle – getting a serious lesson in groove, funk and a spirit of musical community that can’t be taught in school band, private lessons or any other “formal” setting. Without a doubt, he and his peers will grow up to fuse all these influences and produce a new generation of badassery to emerge from this one of a kind city. Just as so many others have for so many generations. If you are a lover of music, do NOT leave this planet before spending some time in the Crescent City! If you’ve always loved the classic Frank Sinatra records from the ’50s and ’60s, but never knew who was laying down those impossibly swinging grooves behind him, permit me to introduce you to IRV COTTLER. Many other drummers also played and recorded with Sinatra in this period (among them Sonny Payne and Speedy Jones – as part of the Basie organization – Alvin Stoller, Sol Gubin, Frank DeVito and Gregg Field ). But Irv Cottler had the longest association, and is definitely worth studying! On this amazing performance of “Luck Be A Lady” from 1966, Cottler kicks in at 1:16 and shows us all just how to do it. 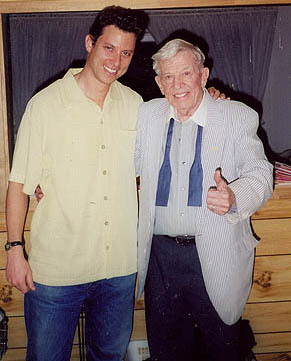 Cottler recorded and toured with Sinatra on and off for over 30 years, starting in 1953. He also played with Louis Armstrong, Bing Crosby, Ella Fitzgerald, and was in the house band for the Dinah Shore show for 12 years. Irv Cottler also put out an instructional book and record called “I’ve Got You Under My Skins,” which includes reproductions of the charts he played with Sinatra. Cool stuff! My appearance at the 2015 Chicago Drum Show was completely centered around paying tribute to Gene Krupa and the 80th anniversary of the birth of Swing (1935-2015). Dr. Theodore Dennis Brown (aka “Denny”) and I hosted two big events to celebrate Krupa: A clinic in which we deconstructed the classic performance of “Sing Sing Sing,” and a roundtable where we discussed Krupa’s life in detail (including the infamous “drug bust” of 1943). To see the full performance of “Sing Sing Sing,” check out the video at the bottom of this post. 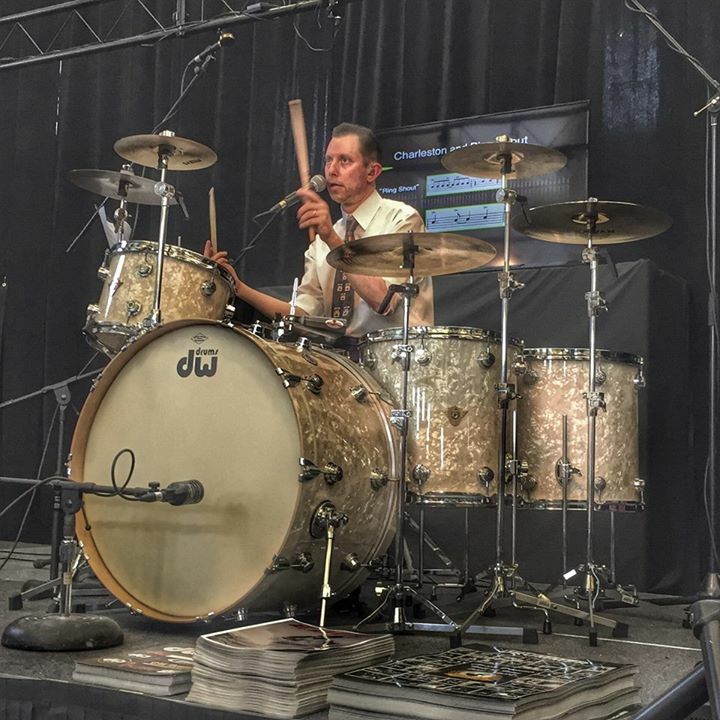 Above is a great shot by Ronn Dunnett (of Dunnett Classic Drums) of the “Tribute Kit” that Drum Workshop Inc. (DW Drums) so graciously put together for me to use at the event. The set up includes a 14×26 bass drum, 9×13 rack tom, 16×16 and 16×18 floor toms. The cymbals are a combination of vintage plates, along with newer SABIAN and Crescent models (the latter was bought by the former in January, so I endorse both companies). The set up is rounded out with heads from Aquarian drumheads & Percussion Accessories (mostly from the Modern Vintage line), Vic Firth sticks, and a cowbell (a key ingredient in “Sing Sing Sing”) provided by Latin Percussion (LP). Thanks to all my companies for creating this phenomenal gear, and for their continued support of my “mission” to share the incredible legacy of our instrument! 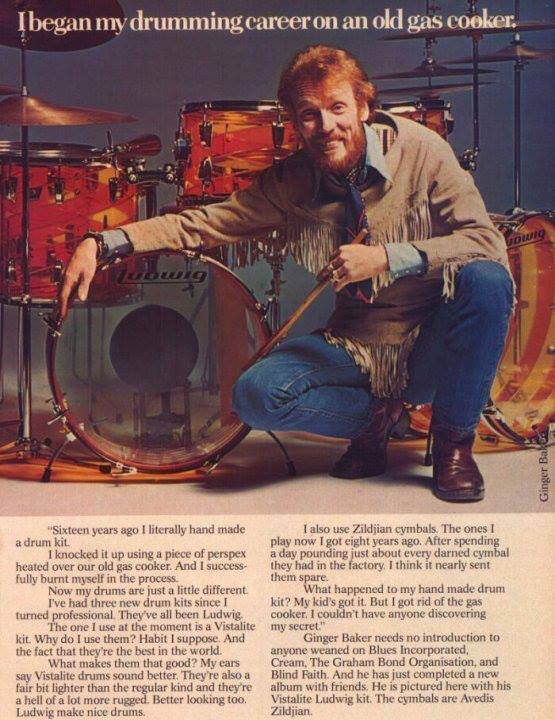 From the Rock and Roll Hall of Fame, Ringo Starr talks about his first Ludwig drum kit. Great story, one that opens up a window into the world of rock’s birth.